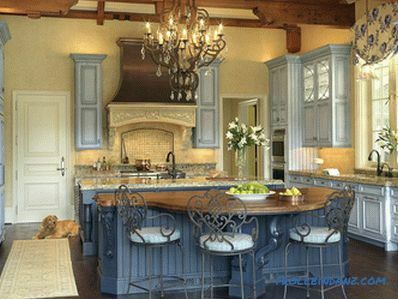 Provence style kitchen is original, recognizable and very cozy. At the heart of the Provencal style are the rural features of the French Riviera with their inherent slowness and measuredness. It is these qualities that citizens value in Provencal interiors so much. 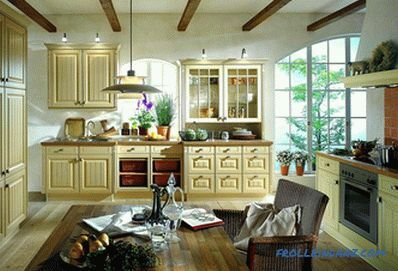 And that is why they are so eager to create an interior in the style of French country in a city apartment. 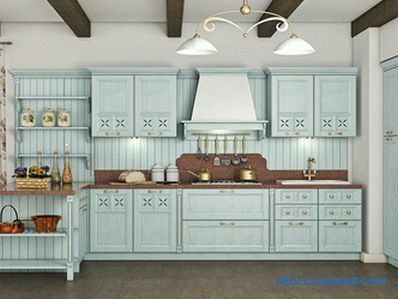 Is it possible to equip a small kitchen according to the principles of Provence, how to do it, what decor and furniture to choose? All this you will learn further. 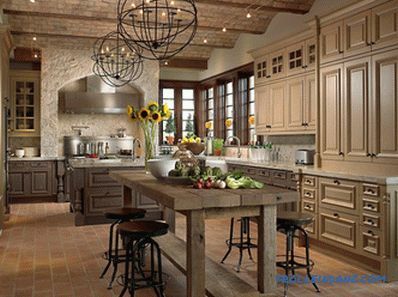 Houses in villages of France on the Mediterranean coast, as well as in the mountains and foothills of the Luberon, are designed so that the kitchen occupies a spacious room. 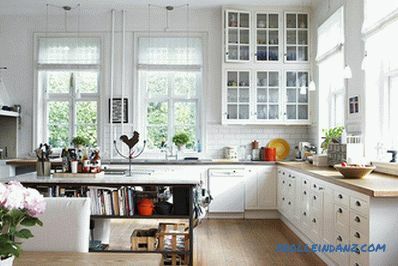 It fits freely in the hearth, cupboards with dishes, cupboards, a dining table with chairs and a work area. There is a place for cooking and for guests. Hospitality and friendliness - features that are inherent to the locals - absorbed the style of the interior. It is customary to meet guests well, to treat them to delicious home-made dishes from beautiful dishes. 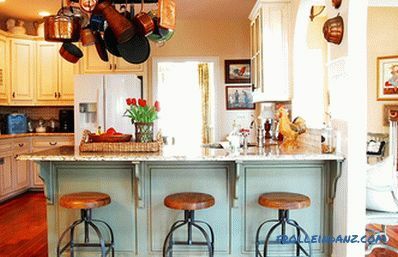 Therefore, the central place in the kitchen is occupied by the dining area, various kitchen utensils, decor and dishes are on display. Seasonings, bunches of herbs, bundles of garlic and onions are hung around the kitchen. These are not just decorative elements, they are obligatory ingredients of the most delicious dishes that are used daily. 1. Walls, floor, ceiling and furniture have whitish, unsaturated shades. This is due to the climatic conditions of the area - for a long time in the year the bright sun is shining, on which any colors fade. 2. The room has good lighting, both natural and artificial. 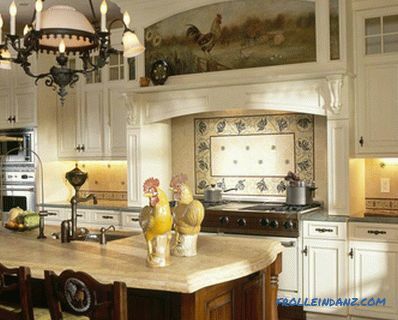 If the windows in the kitchen are small and do not give enough light, then the number of lamps increases. 3. Furniture is selected from natural light wood. It can be painted, worn or chipped in places. The fittings do not have a bright shine, it should look antique. 4. Chandeliers, candlesticks, sometimes chairs can be wrought. 5. Fresh and dried flowers are placed in various places - in clay pots, vases, on shelves. 6. They do not hide the dishes, but put them on the open shelves of the cabinets, complementing it with ceramic figures, decorative napkins and various containers of olive oil, spices or seasonings. The palette of colors of the authentic Provençal interior is quite diverse, although at first glance it seems that everything is completely white around. 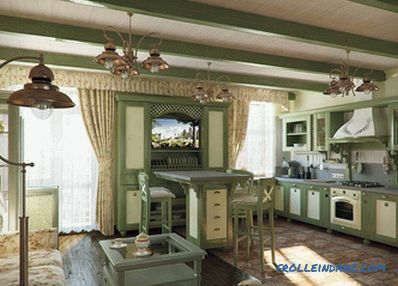 The main decoration of the room and furniture are beige, sand, green, blue, lilac, olive, blue. But all these colors are used in the brightest shades. This technique allows you to convey the authentic atmosphere of Mediterranean cuisine, sunburned. 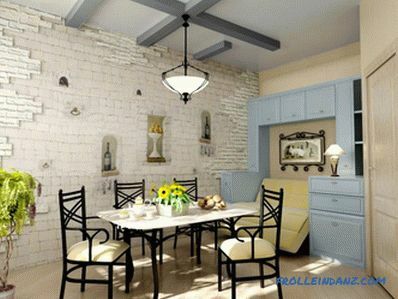 Usually, when finishing a room, a primary color is chosen, which is supplemented with various details and combinations. Consider several options for such combinations. The most natural combination, based on the marine theme. Such an ensemble resembles the blue surface of the sea and the sandy coast. The habitual natural combination, which is daily pleasing to the eye of fishermen, has been transferred to ordinary life. The sand walls are complemented by a brown gamma in which the floor and the ceiling are drawn. Against this background, the furniture of cold blue color in two shades that effectively complement each other looks very refreshing. White is used to decorate walls and ceilings. It helps to expand the space and create a sense of freedom in it. Furniture pick up a light green color. It perfectly refreshes the interior and sets off a strict white color, making it softer and more homely. The floor is made of wood of the usual brown color. 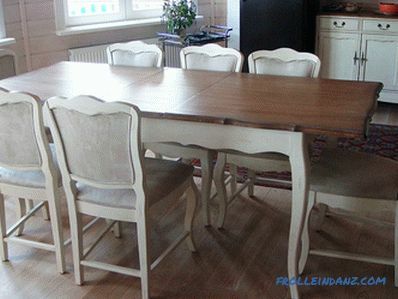 Modern furniture in Provence style is often made in beige. As it is combined with any range of shades. 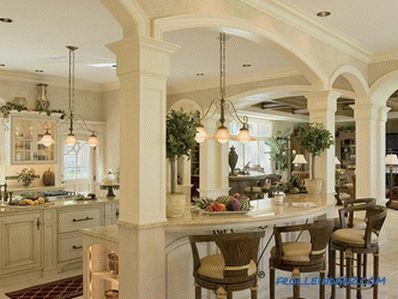 The kitchen in white and beige colors looks very elegant and spacious. These two colors are used for decoration, and furniture, and for kitchen utensils. This combination of natural wood and metal (brass or copper) complements this combination well. Natural ensemble, resembling burnt grass and the freshness of olive groves. 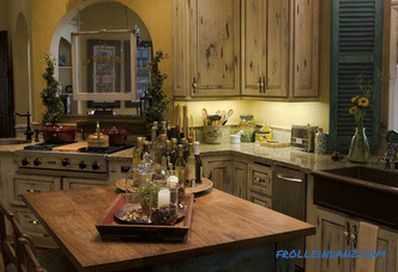 The interior of the Provencal cuisine in olive-beige palette looks home-style simply and warmly. 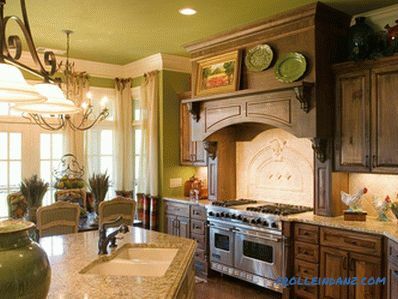 When choosing an olive color to finish the ceilings and walls, it must be diluted with light beige, using it in textiles, furniture, and dishes. Well emphasizes this combination of brown. It is chosen for finishing the floor or the main color for the kitchen. 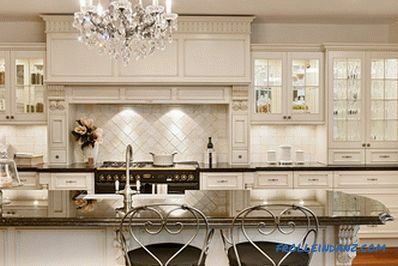 A completely white kitchen is quite common in French country music, especially for modern interiors in this style.The finishing of the room is made completely white, using various textures and materials (tile, plaster, brick). 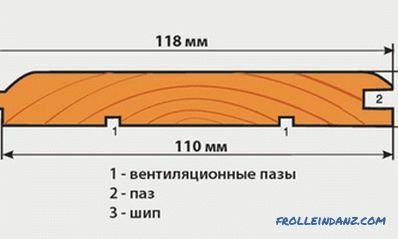 An exception may be the floor, which is made of wooden boards. 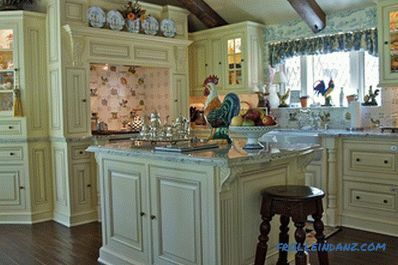 So that the interior of the Provencal style kitchen does not look sterile like a hospital ward, it is saturated with colored decorative objects. 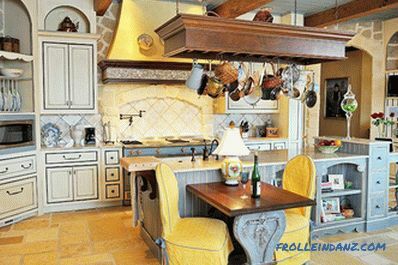 Provencal kitchen design begins with wall, ceiling and floor decoration. The main thing you need to pay attention to during this process is to use only natural materials with natural texture and color. Advantage give brick or masonry, wood panels, plastered for painting or whitewashing the walls. 2. If the Provencal interior is created in a country house, then you can experiment with rough textures - brickwork, stone, wooden logs and boards. Starting to repair the kitchen in the house, you need to bare their natural texture as much as possible, if possible. The walls of the house after construction can not whiten, do not paint or paste over. It is better to leave them as they are - with a well-viewed stonework. Moreover, the more the masonry workmanship is emphasized, the better. This is clearly visible if stones of various sizes were used in conjunction with bricks to build a wall. That is, there is no claim to the professionalism of the handler and the refinement of the material. Everything was done from what was at hand. An excellent addition to this interior solution will be a fully open attic space with visible logs and a floor of stone slabs. A few other finishing techniques can emphasize the French style in the apartment. If possible, use smooth surfaces - plastered walls are painted with a water-based paint or other matte paint, whitened, sewn with a wooden smooth board. 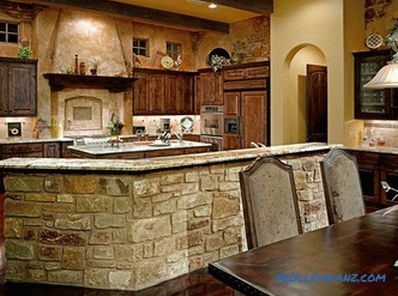 To accentuate the olive color can be used inlays of stone or tile. The colors of all materials are selected in the most light range. This is important. In some interiors, you can find walls that are covered with wallpaper or covered with fabric. This is of course permissible for a modern Provençal interior, but it is completely uncharacteristic of the authentic furnishings of the Mediterranean rural houses and the Luberon. The interior of the village houses is rather picturesque and organically looked like an uncovered attic space. That is, in fact, there is no ceiling at all. There is a roof, an attic space filled with wooden trusses, floors or logs. This design is not to mask and leave as is. It is not possible to repeat this method in a city apartment. So you can only build a house. 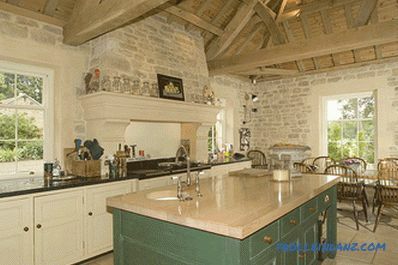 But there is another way typical of Provencal style - decorating the ceiling with wooden beams. 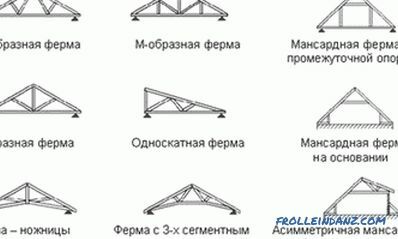 If such a technique is used in the construction of a house, then it is intended to strengthen the ceiling and serves as the basis of the supporting structure. 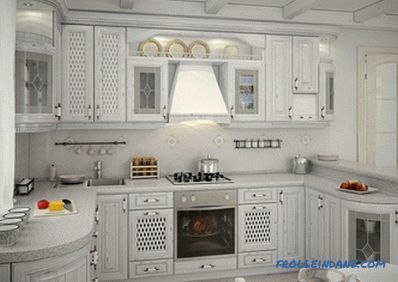 If you repeat this technique to create a Provencal style in a small kitchen in an apartment, then it will have exclusively decorative functions. For this purpose, well-placed false invoices. They will give the desired rural flavor. 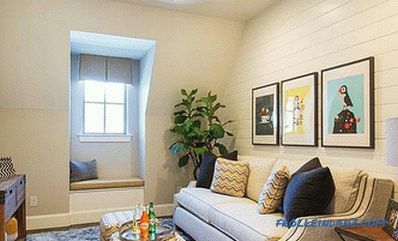 Tip: if your apartment has low ceilings, then you should not weight them with wooden beams or beams. They will look hard and unnatural. It is best to just plaster and paint the ceiling. Creating a rustic flavor in a small apartment, you should not forget about the taboo on modern artificial finishing materials. The ceiling with plastic or vinyl panels will look completely unnatural, the glossy ceiling will not fit into the interior and stretch ceiling. 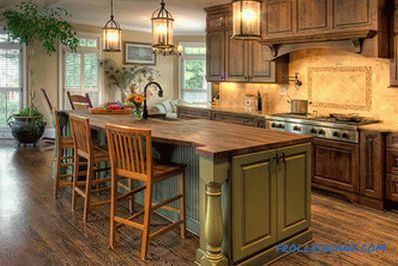 Traditional floors in the interior of the kitchen in the style of Provence are of two types: wood and stone with possible variations. 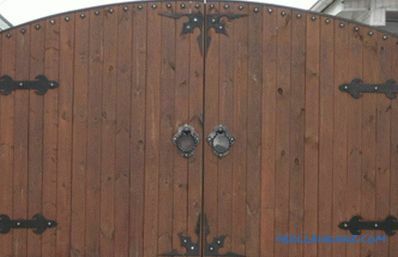 So, for example, for a country house, you can choose materials with a natural rough structure - an unpolished stone or an old whitewashed board. As a floor covering for the apartment, a smooth board, laminate under a tree, parquet and parquet board under a natural tree, a large matte tile made of artificial marble or stone will do. Do not choose glossy reflective surfaces. Excessive gloss and glamor are not peculiar to French country music. Tip: do not choose colorful linoleum, soft carpet, laminate with a fancy pattern for the floor. These modern materials are not suitable.An exception may be a matte self-leveling floor of a dark natural color. 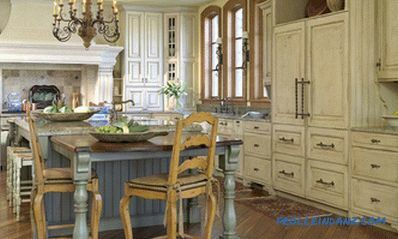 On the question of how to decorate the kitchen in the style of Provence, the very first answer sounds like this: choose the appropriate furniture. 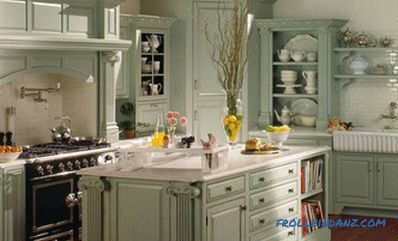 It reflects the style and character of the Provence. 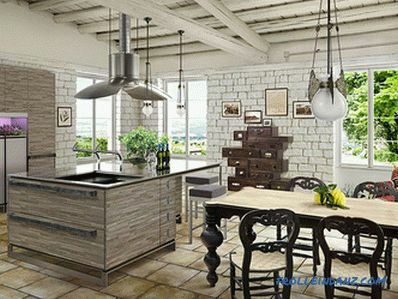 m ogie manufacturers produce new furniture with signs of artificial aging - patina, cracks and scuffed, it will fit into the design of the kitchen in the style of Provence. 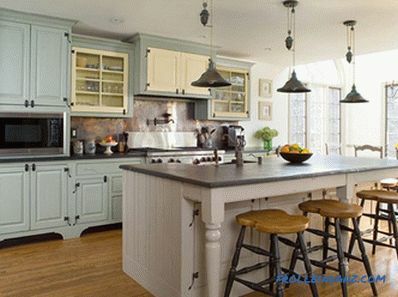 Often to create a cozy atmosphere in the kitchen-dining room using unusual furniture, bought at a flea market or borrowed from the grandmother's attic. It can be forged chairs, wicker cabinets and tables. Forged parts are welcome. Therefore, if there is an opportunity to purchase forged candlesticks or dish holders in a pair of chairs, do not miss it. Feel free to purchase such characteristic things. They will help create the right mood. It should be noted that special attention is paid to seating. They should be comfortable, roomy and original. are made from old wooden array, weave from the vine, pick up forged models. 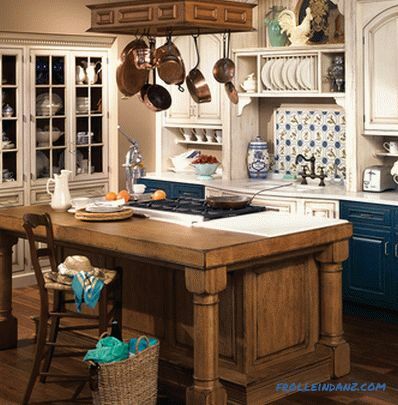 The interior of a cozy kitchen in Provence style is produced by well-chosen patterned textiles. They are decorated with windows, curling them with intricate curtains with ruffles, in pickups, or with drapes. Covering the table with a tablecloth to match the curtains. The tablecloth can half cover the table, it is thrown only through the middle of the tabletop. It is decorated with hand-embroidered corners or fringe around the perimeter. If possible, the upholstery on the chairs is made in the same range of textiles. 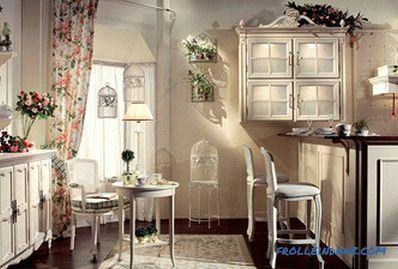 Cafe curtains are decorated with glass cabinets cabinets. But this is rather an exception, since the dishes should still be visible. textiles can be monotonous, have a pattern in a cell of intersecting lines or a small floral pattern; a prominent place. Lighting for Provencal cuisine is selected with taste. It should be a lot so that all corners of the room are lit. In this case, the lamps may not be combined with each other. French women are pretty thrifty housewives. Therefore, in the interior there are items randomly purchased, donated or found. 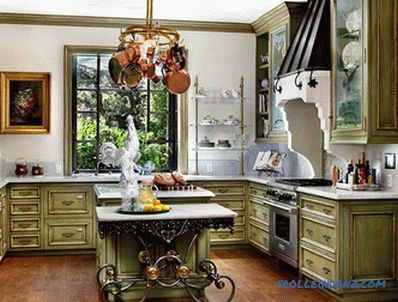 In the classic Provencal interiors dominated by forged chandeliers or from soft non-ferrous metal. Since the houses have high ceilings, the chandeliers hang on long hangings. 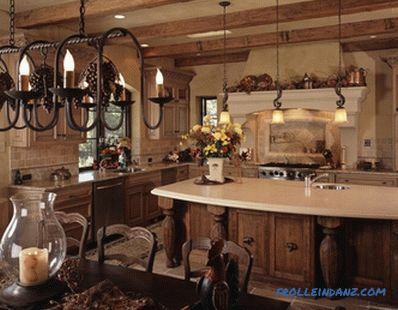 When arranging the decor in the Provencal kitchen, do not be afraid to overdo it. It should really be a lot. 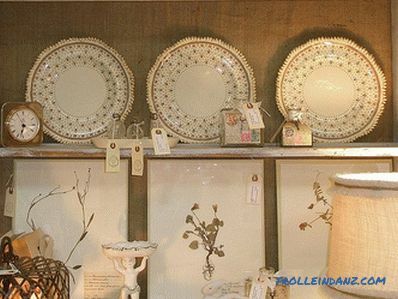 live or dried flowers in vases and paintings. In addition to the practical workload, plates, jars and other utensils play a decorative role. Their housewives put up on the open shelves in the cabinets, hung above the work table or stove, placed in wall cabinets and on the table. Cookware is often a set of the most inappropriate items that are not related to any form, or pattern, or color. In rare cases, country interiors are decorated with sets of ten or more appliances or sets of figures from the same series. 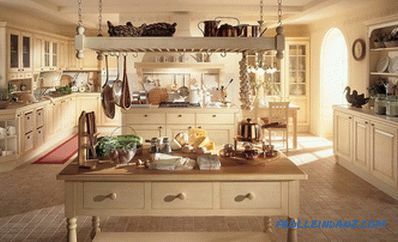 Kitchenware is selected from ceramics, metal, glass, raw clay or porcelain. Bronze, brass and copper devices are polished to a shine and suspended. 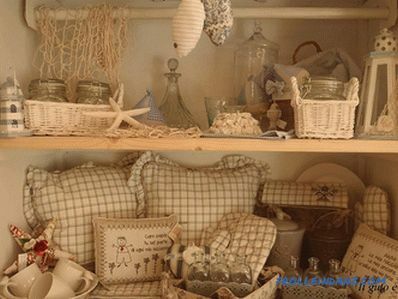 Porcelain cups, plates and figurines are grouped together on the same shelf. Ordinary milk cans and jugs can serve as intended, and can be used as a vase or flowerpot. 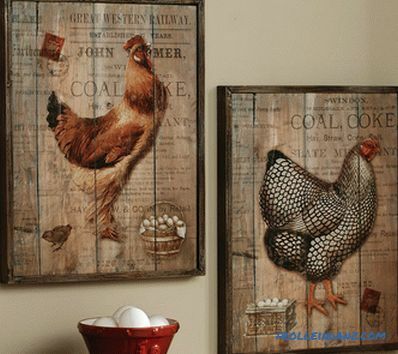 If chips or cracks appear on them, they are not thrown away, but used as a decor. 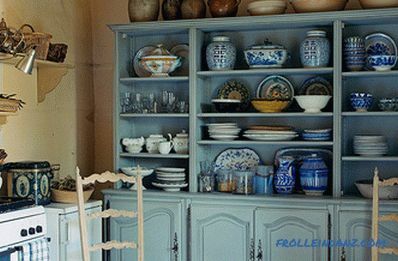 How to decorate a small kitchen in Provence style? If, for example, the room is quite small, and does not allow to pay due attention to the design of the ceiling, or placement of furniture? 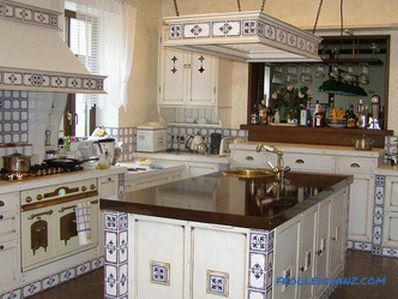 The answer is simple - it needs to be decorated with genuine Provencal motifs, accessories and kitchen appliances. 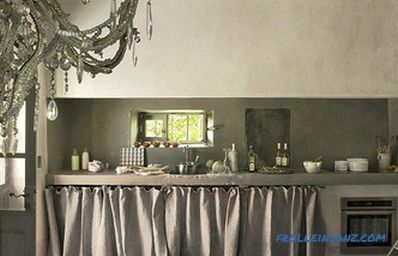 It is the small details that help to recreate the style and romance of the southern interior in a small urban kitchen. 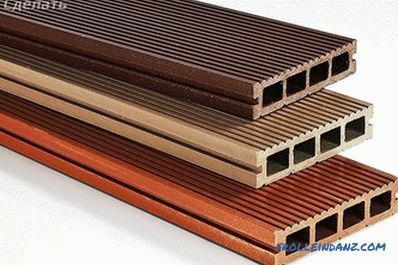 They are selected from artificial stone or wood. In the old interiors, the countertops were laid out with beautiful tiles. 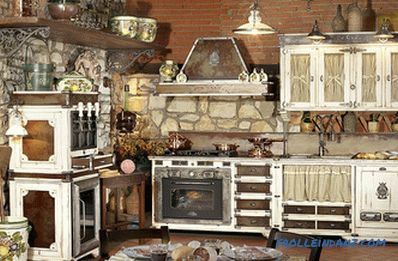 The ideal option for rustic kitchen is not modern chrome taps and mixers, but antique products. It is good if they are of a simple form, with cross-valves coated in bronze or brass. If you can find a natural brass or brass valve - this is good luck. He will perfectly emphasize the style. 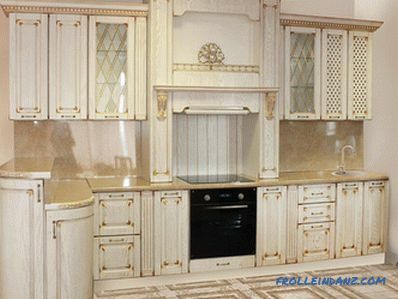 Traditionally, the surface of the wall above the stove is laid out with tiles, plain or patterned. It is important that it shines as little as possible. Sometimes the apron is made from natural stone. 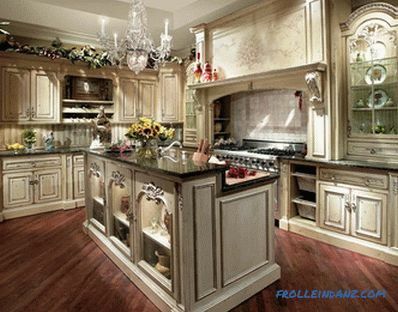 In the working area of ​​the chef there should be plenty of space for cutting food, arranging dishes and spices. On the apron in the work area hang the dishes and jars with seasonings, on the table lay the boards and knives. Often there is enough space in the working area for flower pots. 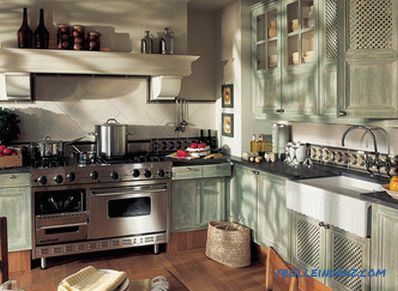 Now you know how to decorate the kitchen in the style of Provence. Below we have brought a few more photo ideas for creating a unique and stylish cuisine.